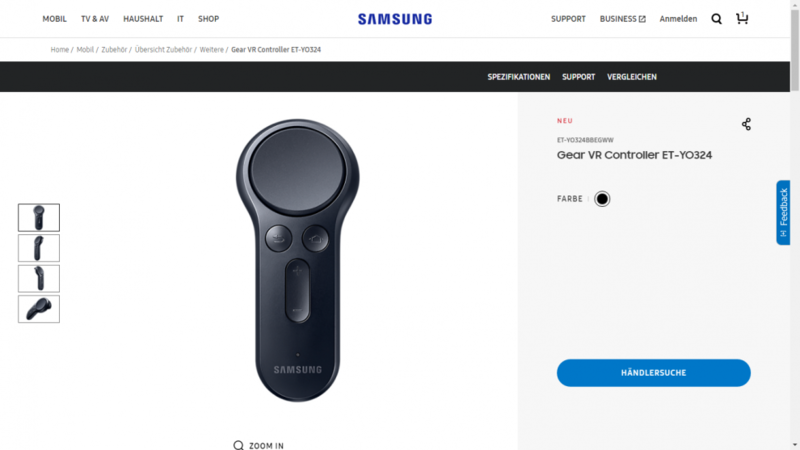 The 2017 Gear VR‘s controller is already showing up at some Samsung Europe pages. Excluding Google Cardboard, the Samsung Gear VR is the most popular VR system at the moment, with over 5 million units sold. However, it faces a challenge from Google Dayrdream, Google’s premium mobile VR headset. Among other things, Daydream has a motion controller allowing for a more immersive means of interaction in games. In response to Daydream, Samsung announced at MWC 2017 that the 2017 Gear VR would have a motion controller as well. Other than the controller, the 2017 Gear VR is identical to the 2016 Gear VR (reviewed here). In fact, Samsung has said that users who already have a Gear VR can buy the controller separately. The controller is now starting to appear in some Samsung Europe webpages. Here is the controller’s page on the Samsung Germany webpage. Samsung Switzerland is already offering the controller for preorder for CHF 45. This likely means that the US price will be around $45. I’m curious to see how well the market receives the new controller. Thank you very much to Sven Neuhaus for bringing this to my attention!